In the previous article, we have set up a Business Manager, created an Ad account and added the necessary features like payment method. Now we are ready to create and publish a Facebook Ad in order to generate sales and to get profit. Make sure that you create a new Ad Space on Admitad so that your affiliate links will be tracked in statistics. Keep in mind — one ad space for each traffic source. Campaign. It is like the main goal of your promotion – the highest level of it. Ad Sets. Here you create different target audiences which you want to reach as well as set budget of this Ad set. This can help you test and find the perfect audience for the promoted products. Ads. The last but definitely not the least. This is where we create the ads which the targeted users will see. It is possible to create various ads for one type of audience. For example, we can make a post with a video, then a post with carousel as well as a post for Instagram — and all these for one audience (of course, if we have enough budget). Hint. Before starting creating an Ad, it’s better to read all the hints that Facebook provides. You can find a hint simply by hovering the mouse arrow over the special sign which you see in the image below. In order to create an ad you need to open “Ads Manager” section and there you wee see the button “Create Ad”, click on it to start the process. You will be transferred to the page where you will have a choice of creating a new Campaign or making an Ad in an existing one. As we don’t have any existing campaign, let’s create a new one. You will see many different purposes of the campaign, in our case it is the generation of traffic to the website, so click on this option and then you will be able to name the campaign. 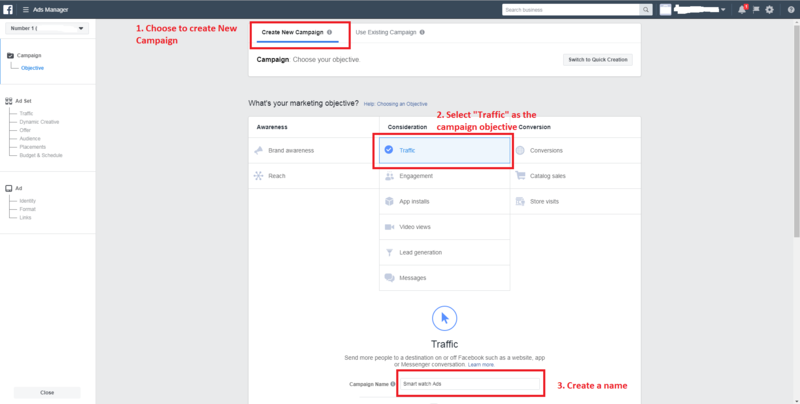 You can also choose budget optimization what will let Facebook distribute the campaign budgets across the ad sets. But we will get back to the financial part a little later. So press “Continue”. The first step is to name it and we will name it in accordance with the target audience of this ad set — “Smartwatch for runners”. Then we need to choose where we will drive traffic. In our case, it is “Website” as we will drive traffic to the advertiser. (Facebook has added a new feature — driving traffic to WhatsApp. It means that when someone clicks on your ad, a message thread with your business will open in WhatsApp). Dynamic creative is a nice tool which lets Facebook optimize ad creatives, but this tool is more relevant to more developed accounts and businesses. You can create an offer in order to drive more sales but in this article we will create a simple Ad. Audience. This is where magic can happen if we set the right audience characteristics. We need to create a new audience and save it (in case we need it for future ads). 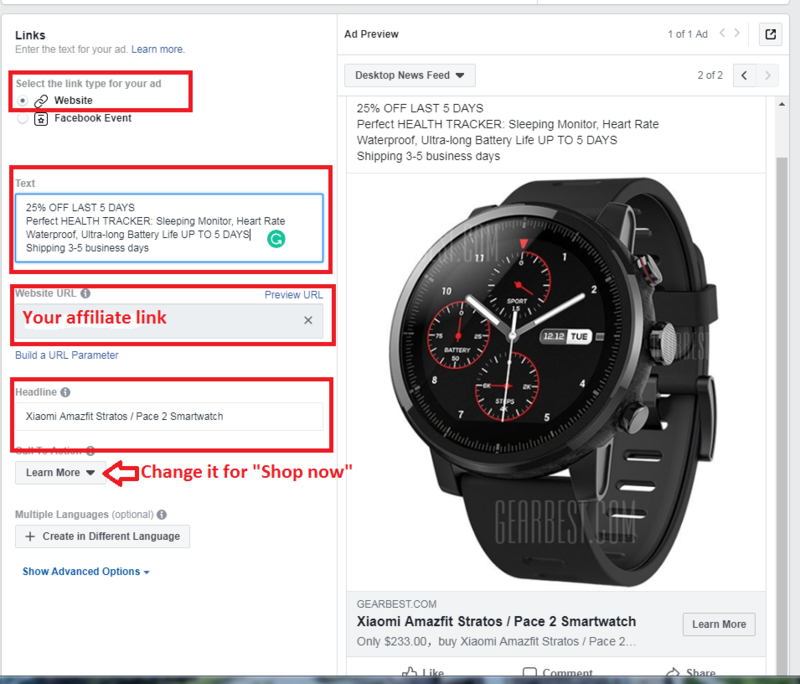 We need to check if the advertiser (in our case it is Gearbest) ships the product (smartwatch) to the location of the targeted audience. So let’s conduct simple research: check where the products of the advertiser are demanded and if the company ships there. Our results: the products are popular in Spain (we have checked it on SimilarWeb) and the advertiser informs on the website that the smartwatch can be delivered to Spain — perfect. We are going to select Madrid as the location of our targeted audience. As our Ad creative will be in English, it is necessary to choose that the Ad will be shown only to English-speaking users (language). Then we need to choose age and gender — let it be male of 25-40-year-old. And a very important point is detailed targeting (interests). Here we can include and exclude people who have particular interests in something. As we are promoting Xiaomi sports smartwatch we chose the following interests: running, workout, Xiomi, etc. We got that our potential reach is 110,000 people what is fine. It is not wise to have the potential reach of several million people. Save this audience if you plan to target it in the future, thus you won’t need to create it again. Placement. Don’t choose an automatic placement as although Facebook has great algorithms, you know much better where to place your ad. It is also not wise to select as many placements as possible, it is much better to choose one or maximum two. 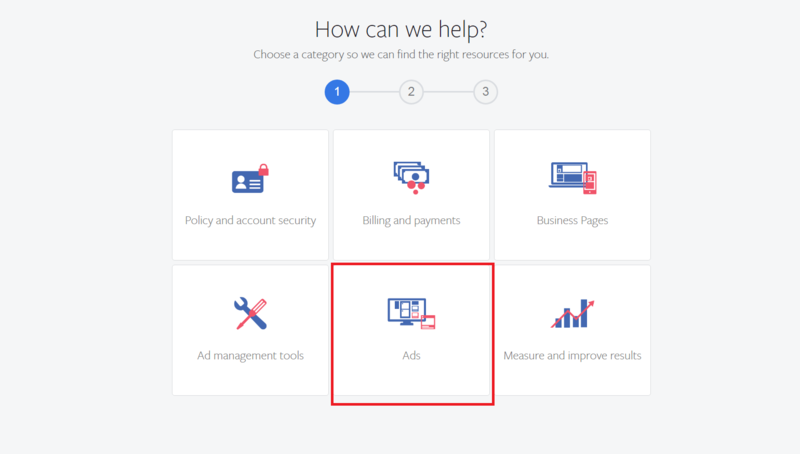 Moreover, different placements require different formats of ads because you won’t be able to use one image for both Facebook Feeds and Stories. We will choose that our ad creative will appear in Feeds. We don’t need to specify the type of mobile device as this gadget can work with any smartphone. 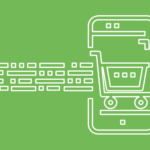 The option “Only when connected to wifi” can be useful if the purchase of the product you promote can take much time as people have usually more time to think when they are connected to wifi — it means that they are at home and have time to think about the purchase. The last step in Ad Sets is Budget&Schedule. 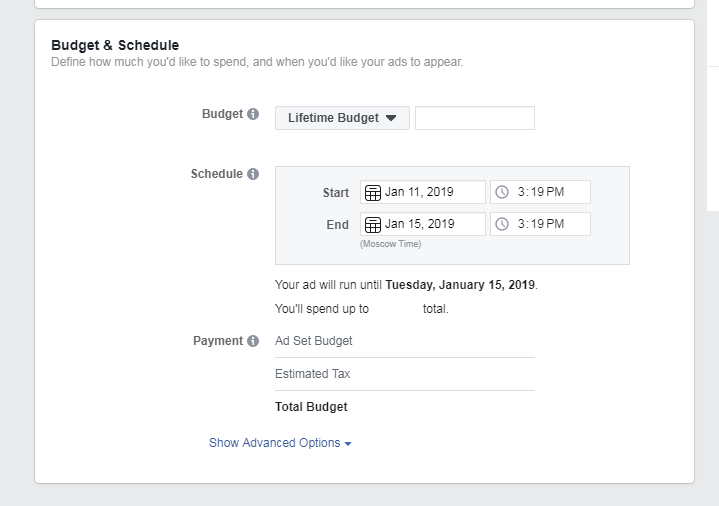 Set the daily or lifetime budget in order to control the amount which will be spent on running an ad. Then choose the dates when you want to run the ad. If you want to test campaigns, don’t make them too long and don’t spend too much — 5 days and not more than $100 will be enough. You can also choose how much you are ready to pay per click by indicating the sum in “Bid strategy”. If you see that an ad is running low, you can increase the payment per click. Here you need to set how much you are ready to spend for this ad promotion. There are two different ways of publishing Ads — you can either promote an already created post or create a post while setting an Ad. As in the previous article, we have examined how to create a post on a Facebook page, this time we will do it in the account. 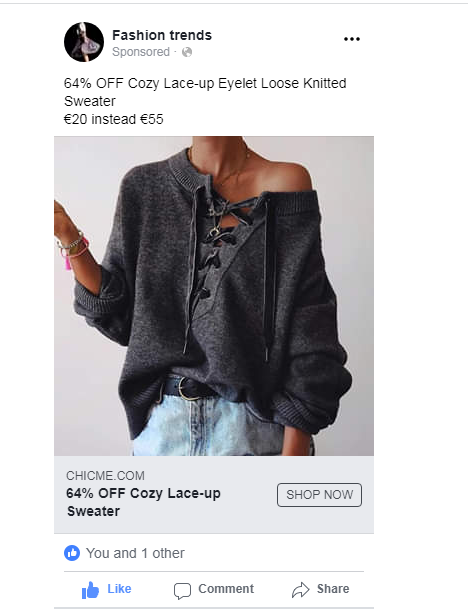 We need to add a nice image to the creative and write a short text with some nice discount so that to attract user’s attention. As our group is dedicated to gadgets, we will choose a smartwatch with good reviews for promotion. Then we create an affiliate link in the Admitad system (to get a reward if users buy the promoted product). It is better to create a Deeplink which leads to the page of good or we will lose much traffic. So having added all the information, we are ready to publish it. Double check everything just in case and then press “Confirm”, then you will see the status of your ad “In review”. Typically most ads are reviewed within 24 hours, although in some cases it may take longer. Facebook will let you know via email when you ad will be approved or not. Add the necessary information to make it more useful. Less than 5 minutes passed after we had published the Ad and we received an email that Facebook didn’t approve it and, moreover, ourFacebook Ad account was disabled because the system considered that the Ad violates the Advertising policy (which is pretty strict and we are going to talk about it a little later in this article). So what to do in this situation? Take a look at the Advertising policy to be sure that you did not violate any rule. 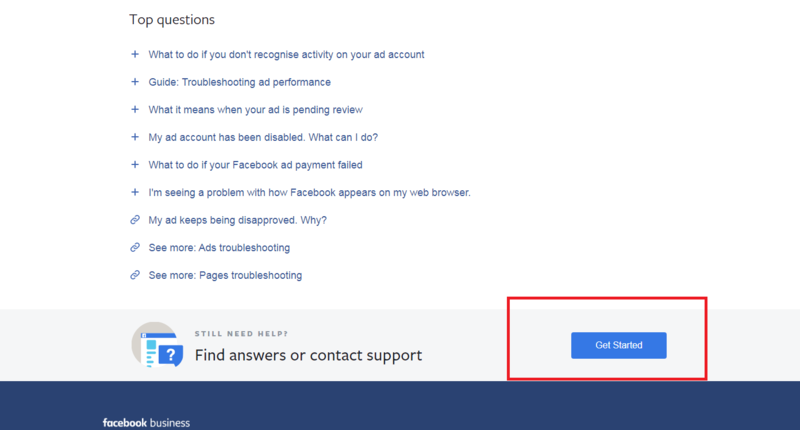 If you are sure that you haven’t promoted anything inappropriate or whatsoever, open the email where Facebook informs you about disabling your account and press on the hyperlink in the text “contact us”. Or use this form. You will be transferred to the Help Center where you’ll be able to appeal the deactivation of your Ad account. Provide there the information why you think it was a mistake and some more facts. You can write something like “Hello! I suppose that my account has been disabled by mistake as I haven’t promoted any inappropriate content. Please, consider this appeal”. Wait for the reply from the support team. Usually, it takes not more than 24 hours to get a reply. You can track the status of your application in the support inbox as well as check your email as you will receive the reply there. We appealed and on the next day, we received a nice reply from the Facebook support team who reactivated our Ad account and apologized. When you have back your account you have two ways of continuing work: either trying to publish the same ad once more or to create a new one with same characteristics. Wait for the approval. And if the ad is approved – keep working and developing your skills. In the end, our second campaign (with same characteristics) was also disapproved and we didn’t receive a clear reason for that, but Facebook reserves the right to reject, approve or remove any ad for any reason. So sometimes it can be not evident why the Ad has been disapproved, but in many cases, publishers make mistakes or create the ads which don’t meet the guidelines. Thus we strongly recommend you to examine the Advertising policies before publishing an ad. We didn’t give up and decided to create a new campaign promoting a completely different product — a sweater. We selected the same objective of the campaign, set a target audience (location – Paris, female of 20-30-year-old), made a creative and sent the ad for the approval. We also had to create a new Facebook Page “Fashion trends” and link it to our ad account. 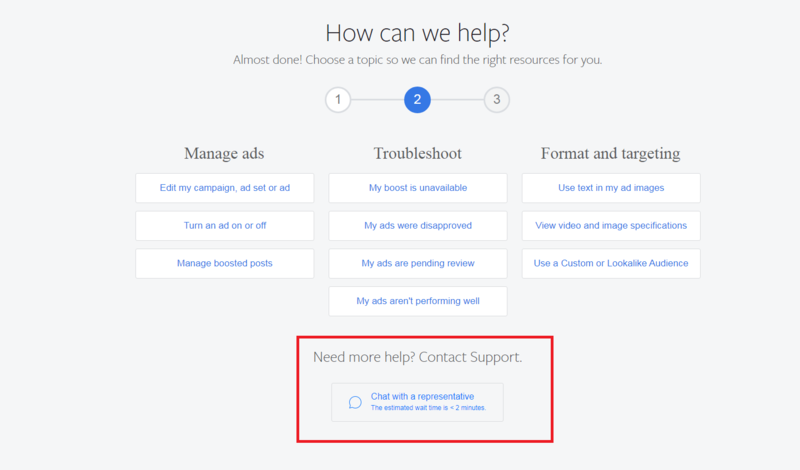 This time our ad was pending review for a little less than 1,5 day, so we decided to contact a support team through chat and ask what was the matter. A support team member reviewed the issue and helped — in about an hour we finally got the answer and our ad was finally approved! You can find Facebook support chat through this link. The results which you see in your Ads Manager. Bid strategy. This parameter displays either the lowest cost or the sum which you have set which you are ready to pay for 1 result (for example, link clicks). You can choose the strategy in the Ad Sets. Budget. Here you will see the budget limit you’ve allocated (daily or lifetime). You can change it at any time. Results. This parameter will reflect how many times the result has been achieved. The result can be a link click, post engagement, 3-second video view, registration or any other which you’ve set while creating the ad. In our case, it is link clicks. Reach. This indicates how many unique users have seen your ad. Impressions. This shows how many times in total your ad has been displayed. Cost per result. This parameter shows how much you’ve spent to get one achievement of the result. For example, for one click on your link. Amount spent — how long you’ve spent on showing ads so far. Ends — when the campaign stops running. Relevance score. This parameter is important and shows from 1 to 10 if your ad is relevant to the audience you’ve chosen. Your ad shouldn’t go beyond score 5. If it happens, it is better to change the target audience. Frequency. The average number of times each person saw your ad. Unique link clicks. The number of people who performed a link click. Link clicks. The number of clicks on links within the ad that led to destinations or experiences, on or off Facebook. For ads promoting Instagram profile views, link clicks include clicks on the ad header or comments that led to the advertiser’s profile. When you have many campaigns and ads, you can filter the data you are seeing by using filters. We have mentioned the policies several times and it is an important aspect of running Facebook Ads. All creatives are checked by Facebook and if the Ad is considered to violate the Policies, it will be disapproved. So let’s briefly examine the main points of the policy to avoid disapproval. Never promote any prohibited content such as illegal services or products, tobacco products, drugs&drug related products, discriminatory, sensational (shocking, disrespectful), controversial or false content, adult content, links to non-functional landing pages, payday loans, sale of body parts, personal health, and other not appropriate materials. The network also restricts some types of content which you can use in ads only in accordance with the requirements (for instance, only for people aged 18 and older). Such types include alcohol, dating, real money gambling, financial and subscription services, weight loss products, cryptocurrency products, and services, etc. Facebook can also disapprove the Ad because of bad grammar and punctuation. Any type of Ad (image, video) must comply with community standards. Video Ads (or similar ad types) must not use overly disruptive tactics, such as flashing screens. Target Ads cannot discriminate against, harass, provoke, or disparage users or engage in predatory advertising practices. 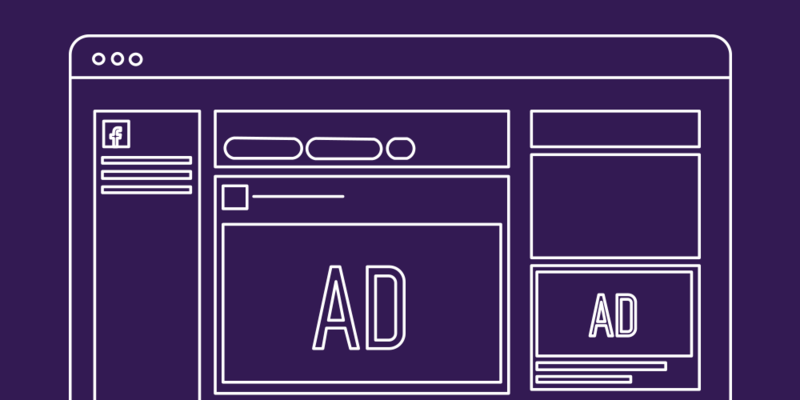 Ads must clearly represent the company, product, service, or brand that is being advertised. 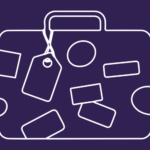 If you lead the users to the landing page from the Ad, this landing page must contain the products which are represented in the ad, and the destination site must not offer or link to any prohibited product or service. The text on the images should not cover more than 20% of the image’s area. 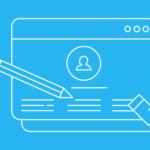 If you create the lead ads, you must not request the following types of information: criminal history, religion, race, financial or insurance information, username and passwords, government-issued information (such as passport numbers), etc. If you want to feature Facebook or Instagram brand in your ad, you need to meet the brand guidelines. You should share the data gathered from Facebook advertising only with those who act on your behalf (e.g. service providers). 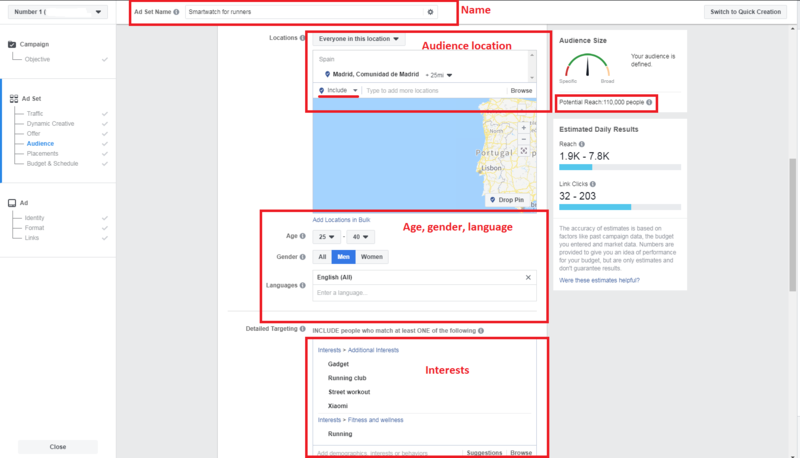 You should use Facebook advertising data to assess the performance and effectiveness of your Facebook advertising campaigns. As we said, Facebook reserves the right to reject, approve or remove any ad for any reason and you need to understand that once your ads displayed, they become public information. The network also requires to create different Ad accounts to promote different advertisers. It is not hard to create and run a Facebook Ad, although it can be time-consuming especially when you create it for the first time. It is necessary to remember that first of all you create a campaign (objective), then you create an Ad set (targeting, budget, and placements) and lastly you create the ad itself (format, link, headline, text). And this is how a Facebook ad is created and published. Admitad has CPL offers. Here is how you can find them: open catalog of programs and in the right column, you will see the filter “Action type”, select “Lead” and there you’ll see CPL offers. Thanks a lot for the article !! It really helped me out.